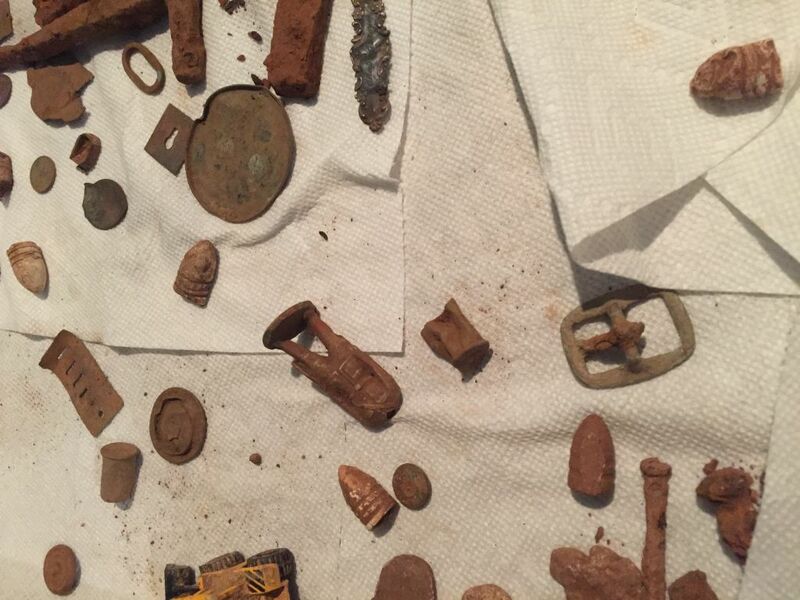 A peak inside an antebellum house near Marietta Square uncovers old relics for the Goldsteins. 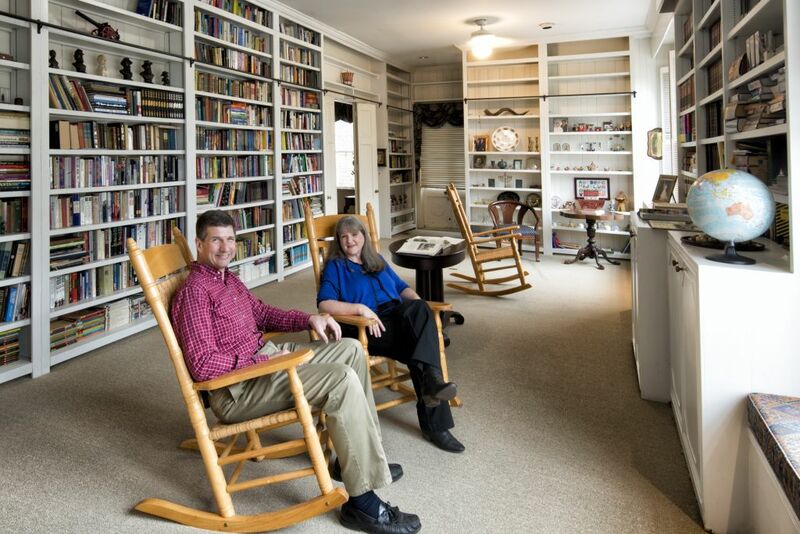 Elise and Philip Goldstein are preserving history at Ivy Grove with a mansion of more than 10,000 square feet. We have covered a wide variety of homes and artists in this column. Never before have we shared a historic landmark, featured alongside the Big Chicken in Marietta as a preservation treasure. 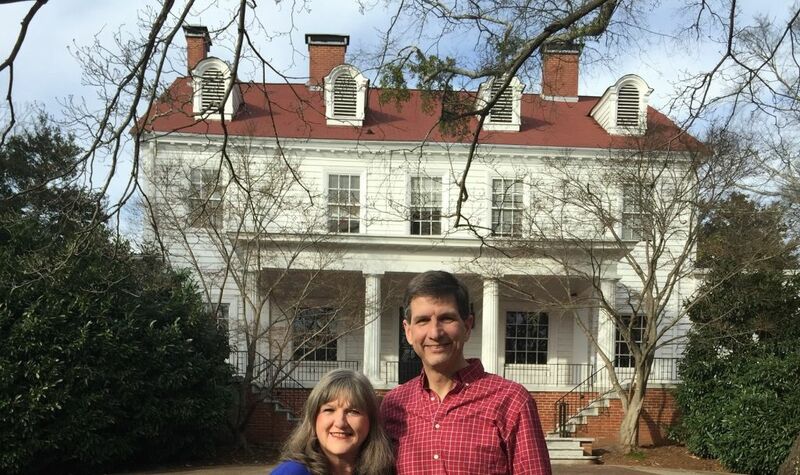 Third-generation Cobb County resident Philip Goldstein and his wife, Elise, recently bought Ivy Grove, an antebellum mansion that has been destroyed and rebuilt on 5.94 acres just blocks from Marietta Square. Philip, who serves on the Marietta City Council, has Marietta roots dating back to 1912, when the family opened a dry-goods store that operated for nearly a century on the square, where he remains a major property owner. 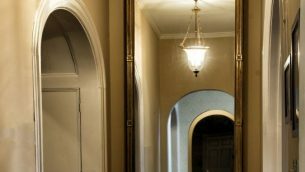 He and Elise are dedicated to restoring the over-10,000-square-foot house to its original glory as a family compound with a Jewish touch. With a massive dogwood tree, the land is replete with gardens, a fountain, a Hollywood-scale pool and a Southern porch Aunt Pittypat would envy. Philip has excavated to recover the original garden boundaries and a marble patio, while Elise, who is musically inclined and sings in a synagogue choir, plays records on an antique phonograph in the music room. Take the historic tour with us. Jaffe: Tell us about the history of this estate. Philip: The property was part of the Cherokee Land Lottery passed in 1831 by the Georgia legislature and first went into private hands in 1837. 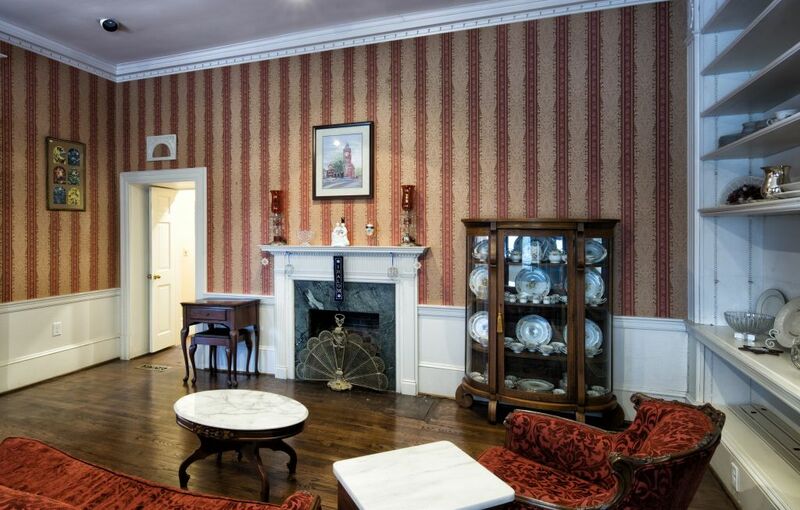 The house dates back to 1845. I’m a history buff; and I had an eye on this house for a long while. In 1864 the deed was destroyed when the Union troops left Marietta and the courthouse was burned. Fortunately, the then-owner refiled the deed, so there is only a five-year gap in the title, which is rare in Cobb County, as the early deed books burned with the courthouse. 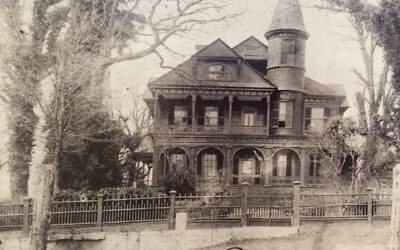 The house burned to the foundation in 1925 and was then rebuilt on the foundations. 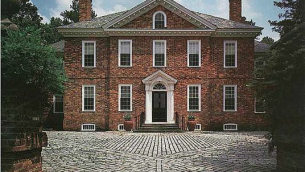 At one point, it was owned by the McNeel family, who owned a large marble company. Thus, you see the marble fireplace mantle and extravagant use of marble in the bathrooms. Four generations of the McNeels lived at Ivy Grove from 1872 to 1945. The photograph from 1891 shows one of the owner’s sons, Mr. Freyer, on his “High Wheel” bicycle in front of Ivy Grove. 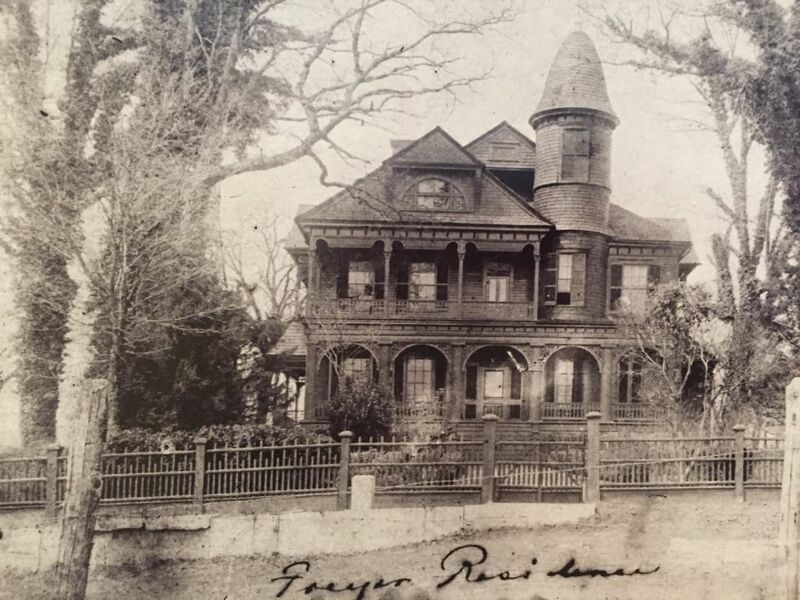 An 1891 photograph shows Ivy Grove when it belonged to the Fryer family, part of the McNeel clan. That house burned down in 1925. In the 1940s most of the porch fronting Cherokee Street was converted into separate men’s and women’s restrooms and dressing areas. The ladies dressing area and closet setup are quite unique. In 1980 the master wing, large game room, garage and mother-in-law suite were added. Philip: The original land encompassed 1,200 acres. We now have 5.94 acres, and we are only six blocks from the downtown Marietta Square. Much of the original land is now subdivisions. We love the gardens. … We have planted figs, table grapes, apples, peaches, blueberries, pears and plums, and soon rose and vegetable gardens. The two tennis courts need work, along with the 98,000-gallon pool. 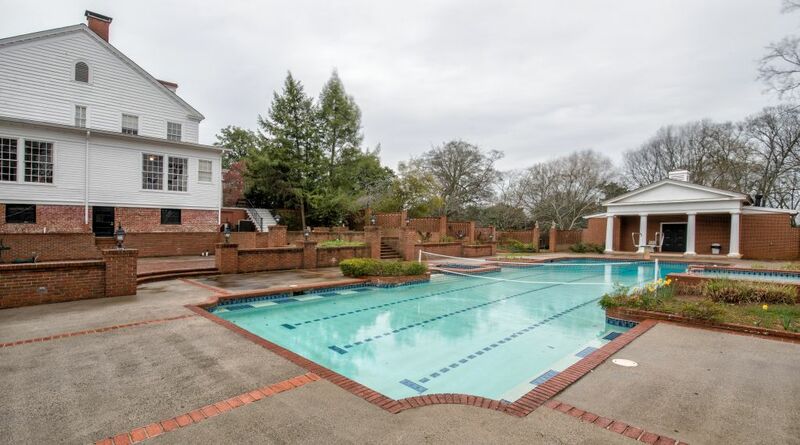 There is a freestanding pool house. We have six separate heating and cooling systems. Again, we kept the bones of the house and enjoy the privacy. 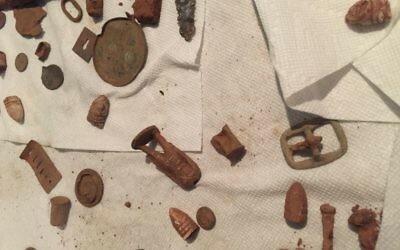 For three days the North Georgia Relic Hunters scoured the dirt and found all sorts of interesting treasures: toy soldiers, bullets as seen in our display area. 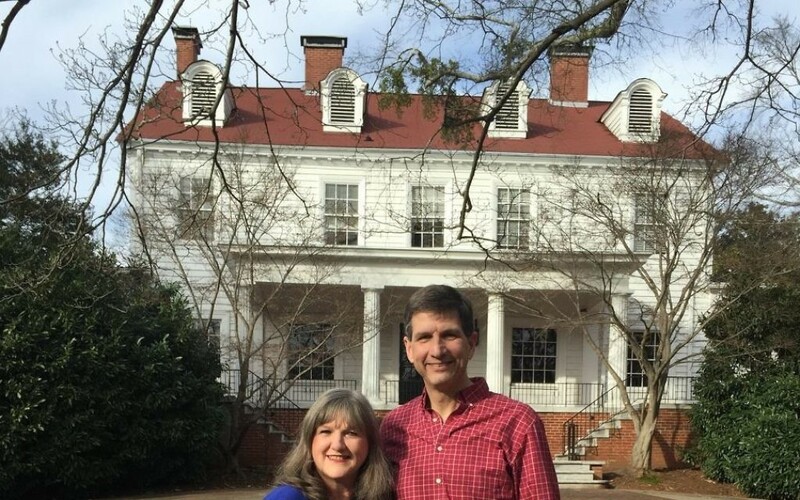 We believe a portion of the grounds were used as a hospital tent during the Civil War. A soldier had to bite the bullet to avoid pain sans anesthesia; some of the bullets have teeth marks. 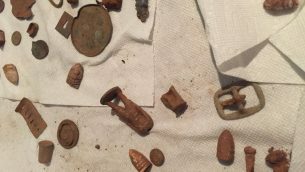 A three-day search of the ground turned up relics such as a belt buckle, toy soldiers and bullets, some with bite marks. Jaffe: What about the background of the Goldstein family? Jaffe: How do you plan to use Ivy Grove? Elise: Right now, it is a family compound and recreational retreat. We had over 40 for Thanksgiving, family reunions and Passover. It is a long way off before we settle in as our primary home. We let special-occasion groups like Marietta High School shoot a group prom photograph on the porch. Philip: We have created a wall in the entrance which shows the history of the house and grounds. We have also featured our family’s history in Marietta in the game room and office with pictures and artifacts from the store. Jaffe: What furnishings came with the house that you are keeping? Elise: Many of the chandeliers and draperies came with the house. The ceiling-size mirror bench in the hall was originally mahogany, then gilded in 1980. The majestic dining room chandelier was stolen while the house was for sale; and we replaced it with one from a 1920 Morningside house estate sale. The hardwood floors and arched doorway are treasures. 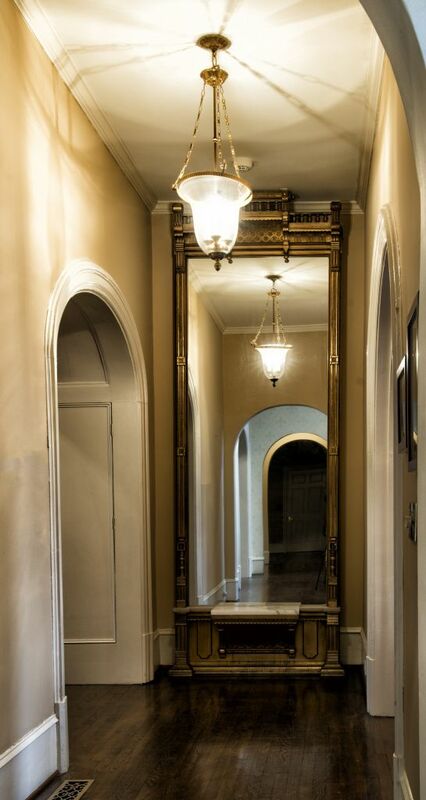 This original floor-to-ceiling hallway mirror was gilded in 1980 over the original mahogany. 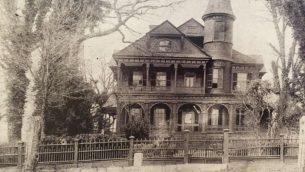 Jaffe: What are some unusual features of the house? Elise: We have a kosher kitchen: two dishwashers, two sink areas, dual appliances, etc. 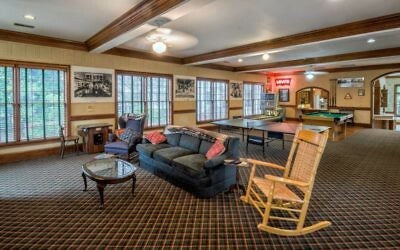 A three-stop elevator, the rec room with a ping-pong table, video game machines and full-length bowling alley. 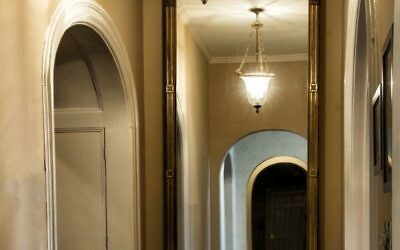 Downstairs, we have the mother-in-law suite traditionally decorated. Jaffe: What will this house look like in 2022? Philip: The same as it looks now, except it will have been repaired, where needed, and have a new coat of paint. We are seeking the right furniture and wall hangings or memorabilia. The grounds will be very colorful, as the trees and gardens will come to life and blossom. Jaffe: You weave quite an unusual tale for Southern Jewish history. 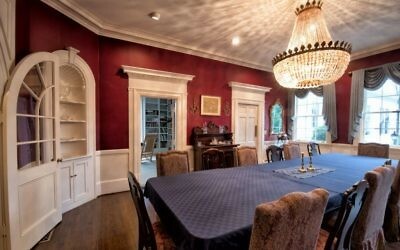 The dining room has ample room for entertaining, although the chandelier is a 1920s-era replacement from Morningside because the original was stolen while the house was on the market. 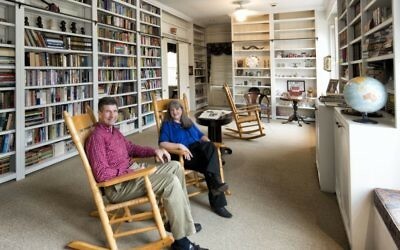 Philip and Elise Goldstein enjoy their Judaica and Southern books while rocking in the library. 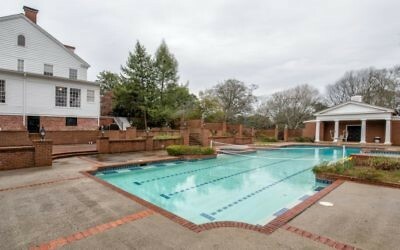 The Goldsteins have a 98,000-gallon pool and a freestanding pool house. 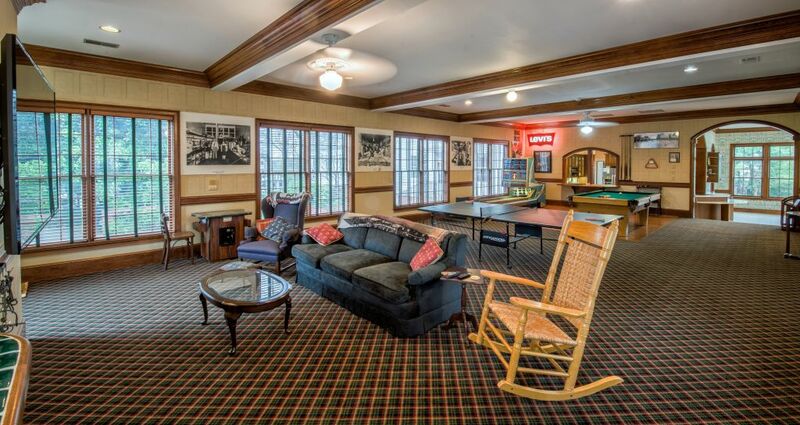 Photos and other memorabilia from the Goldstein store are part of the background in the rec room, where the family can watch videos, bowl or play table games. 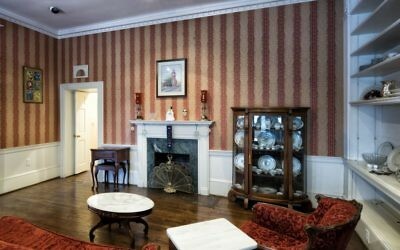 The music room has Judaica on the mantle, an antique phonograph and highly textured, burgundy, flocked fabric.